5-7pm at the Kirk. If the weather is nice, we will be outside. If it is raining we will be in the chapel. Rain or shine the party goes on. We want the celebration of Easter to continue on, so join us tomorrow as we feast in the form of a potluck, worship through reflection and music, and play hard as we rejoice over the resurrection. All D Groups are cancelled tomorrow night so that everyone is encouraged to attend. We will eat when the food arrives. Find out what is assigned to your group below. This Sunday from 5:30-7:30pm in the Fellowship Hall is the Matsuri and our last SNF of the school year. This is it, our last big group gathering before we head into the exciting months of summer. It is a great time to invite friends, have fun, connect with your church people while helping support the Japan Team. That’s right, we have rented a sumo arena as one of our booths for the Matsuri. It will be one of the many fun ways to learn about Japanese culture and experience a little bit of what our team should expect on their trip to Nagoya, Japan. Matsuri is a festival that will be filled with booths that will have food, games, and information about where we are going and what we are doing. Buy tickets for the booths on sight to upgrade your food and game experience or come for free and still enjoy the Matsuri experience. (Tickets are $1 a piece and each dollar goes towards supporting the Japan Missions Team. To get the full experience, we recommend purchasing at least 10 tickets). The Kirk Student Ministry would like to invite you to a night of celebration as we honor our graduating seniors. We use this night to look back at the Lord's faithfulness and to look forward to all He has in store for this next stage of life. Please join us in the Kirk chapel on May 5th at 5pm for our Senior Celebration. We will enjoy dinner together, a time of encouragement, and worship. In order for us to make sure we have plenty of food, please RSVP by April 29th to sneedler@thekirk.org. Keep em’ coming! We want everyone to have a chance to sign up for our two big summer events. These are incredible opportunities to dive deeper into God’s Word and deeper into relationship with God’s people. Preparations for Matsuri and packet handout for expectations of remaining months before departure. All Japan Team Members are expected to be at this meeting. Haggai: Who is he? What was his message? How does/did he echo the heart of God? Question 23 & 24: Why must the redeemer be truly God? Why was it necessary for Christ, the Redeemer, to die? All 6th-12th Grade students are invited to join us for the last SNF of the season in the Fellowship Hall from 5:30-7:30pm. Bring some cash if you are wanting to get the most out of the experience or come as you are and still enjoy the evening. All money raised from the evening will go towards our Japan Missions Team. This is our last chance as a group until September for us to gather as a full group. We have so many opportunities for us to gather during the summer, but do to your schedule and ours, it is hard to get everyone together fully during the summer months. This is why we encourage everyone to try and make an appearance at our last SNF. We hope to see everyone at our Easter Party this Wednesday from 5-7pm at the Kirk. 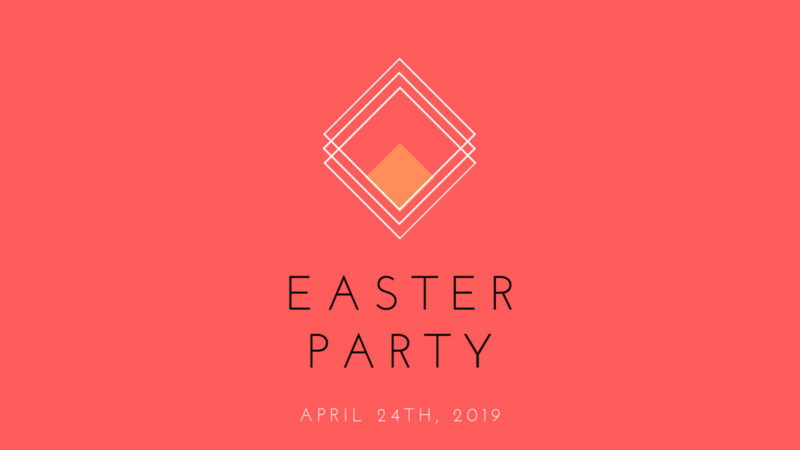 It is a great time to take a break from studying and a great time to connect with your D Group and others while celebrating our risen King. DID YOU KNOW WE HAVE A PLACE ON THE STUDENT MINISTRY PAGE WHERE YOU CAN SUBMIT YOUR PRAYER REQUESTS? We are so excited to launch our new podcast series, “I Have One Question For You” (IHOQFY). Our series kicks off with the question, how do I get teenagers to read the Bible? If you want to hear our own story or what we have seen work throughout the years in youth ministry, take a listen wherever you listen to podcast. Just search, Student Ministry for Parents or click below. HOW DO I GET TEENAGERS TO READ THE BIBLE? It is a Student Ministry tradition to be the official hiders and guardians of the eggs at the Kirk’s Easter Egg Hunt. If you are willing to help hide the eggs and reminisce over the years you used to be the egg hunter, we would love to have you join us this Saturday, April 20th @ 9:30am at the Kirk. Service hours will be provided for those who need them and bring cash for Cane’s chicken for lunch if you are wanting to stick around. In order to have enough food for everyone and to truly make sure it feels like a feast, we have decided to make the Easter Party into a potluck. Find your D-Group assigned potluck dish below. It does not have to be fancy. Make what you love to eat and what you love to make. If you have multiple kids in multiple D-Groups, pick one D Group to represent and just make a little more of that one dish. The Japan Missions Team is putting on a festival to cap off the SNF season. It is a festival that will be filled with booths that will have food, games, and information about where we are going and what we are doing. Buy tickets for the booths on sight to upgrade your food and game experience or come for free and still enjoy the Matsuri experience. (Tickets are $1 a piece and each dollar goes towards supporting the Japan Missions Team. To get the full experience, we recommend purchasing at least 10 tickets). In order for us to make sure we have plenty of food, please RSVP by April 29th to sneedler@thekirk.org. Also, please let us know if anyone in your family has a food allergy. You are welcome to bring siblings, grandparents…whoever you would like to bring! If you are an attending senior we also would love up to 10 pictures of your student (from birth - present day) for the slide show we put together for the night. Please email these to sneedler@thekirk.org as well. WE WILL NOT HOLD OUR NORMAL SMS CLASSES. INSTEAD, ALL CLASSES ARE INVITED TO JOIN THE EASTER ADULT SUNDAY SCHOOL CLASS ON THE RESURRECTED BODY. This Sunday is Easter and we hope that you all are here for either or all of our Easter morning services and programs. There will be no Sunday night activities to allow time for you all as a family to celebrate Easter in your own homes and to allow our volunteers and staff to do the same. We will see you all the following Sunday for our last SNF, which will be in the form of a festival! Please contact your D Group leader on details for this week’s meeting. If you are looking for a way to connect more in the Student Ministry and wanting to grow in your relationship with other students and Christ, think about joining a D Group. Connect with our leadership to see what your D Group is doing. It has been a very special year at Kirk of the Hills since we are celebrating 50 years as a church and ministry to St. Louis. It has been 50 years of displaying the gospel to our neighbors and our city and it has been 50 years of Student Ministry at the Kirk and we are very grateful for that. We are very thankful that there were willing people to answer a call to plant the Kirk, to join the Kirk, and establish a youth ministry at the Kirk because we are the inheritors of that. Come and join us this Sunday for a time of celebration and worship during our 10am worship service that will commemorate the 50 years as a church and God’s faithfulness to us as congregation throughout these decades. Easter is the reason for the church and we want more than one day to celebrate that. Can you blame us? Let’s keep the party going. Join us Wednesday the 24th for our Easter Party. We want to truly celebrate why we have a relationship with any of you and that is because of the Resurrection of our King Jesus, which, at the very least, deserves a party. We have a feast planned, a game planned, and worship experience planned all to celebrate Easter and its meaning. We are really beginning to make preparations for our missions trip to Nagoya, Japan. If you are wanting to know more about where we are going, what we are doing, and how you can support us as a team, please join us Sunday, April 28th @ 5pm at the Kirk. It is a free event, but there will be options to purchase tickets that will provide a more enhanced experience of the festival. Mark your calendars for the last Sunday in April. If you want to learn more about our trip or find ways to support the team in the meantime check out our webpage. The month of May always marks our transition from our regular programs and events into our Summer calendar. Much of the month is vacant and that is intentional to prepare for summer and for you all to prepare for the end of the school year. However, we do hold one event and that is our Senior Night. It is a time to celebrate our seniors and give them a night that they deserve. Much of what has been normal for most of their lives is about to change, either drastically or minimally. Graduation is a marker that should not go unnoticed and we want to celebrate our seniors for their steadfastness and perseverance that is often required of high school seniors. We also want to give them a message that will encourage and prepare them more for what is next to be faithful stewards of the Christian faith. Join us on May 5th. We do not have SNF on the night of Easter and the last Sunday in April is our Japan Festival, which marks the end of our regular school year programs. If you are available, we hope that you can make it this Sunday Night.